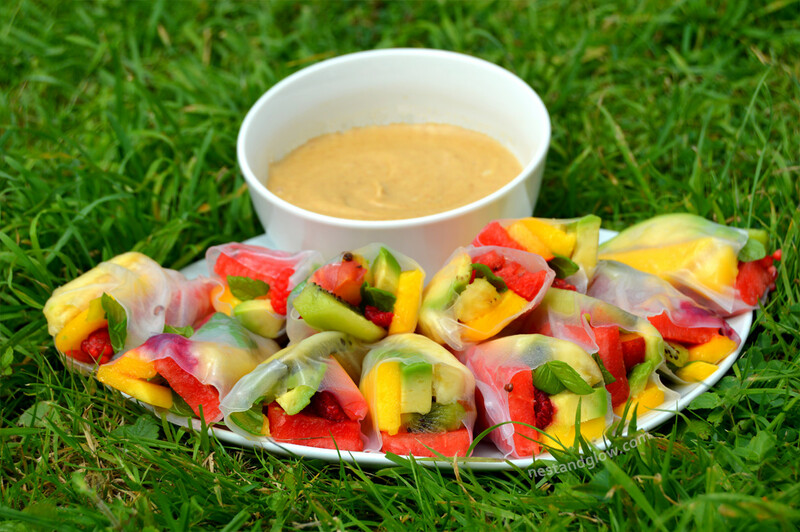 What is better than a rainbow of fruity summer rolls dipped in salted caramel? 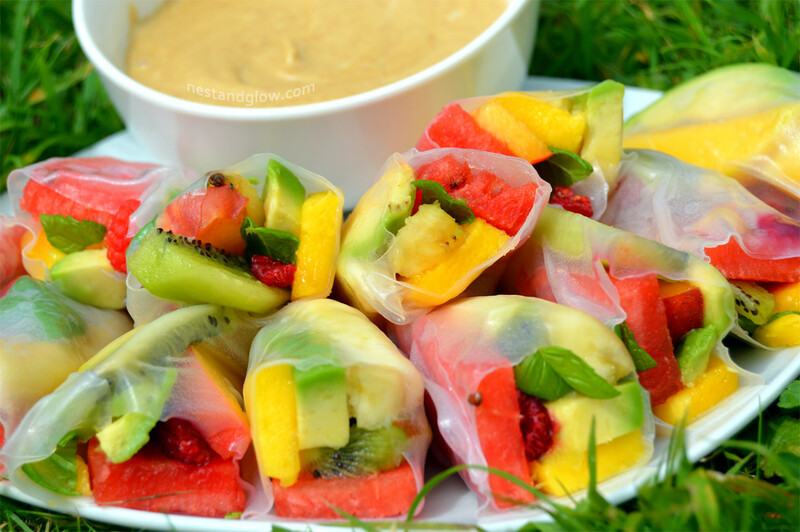 These rolls are very easy to make and you can use any fruit that you have / is in season. 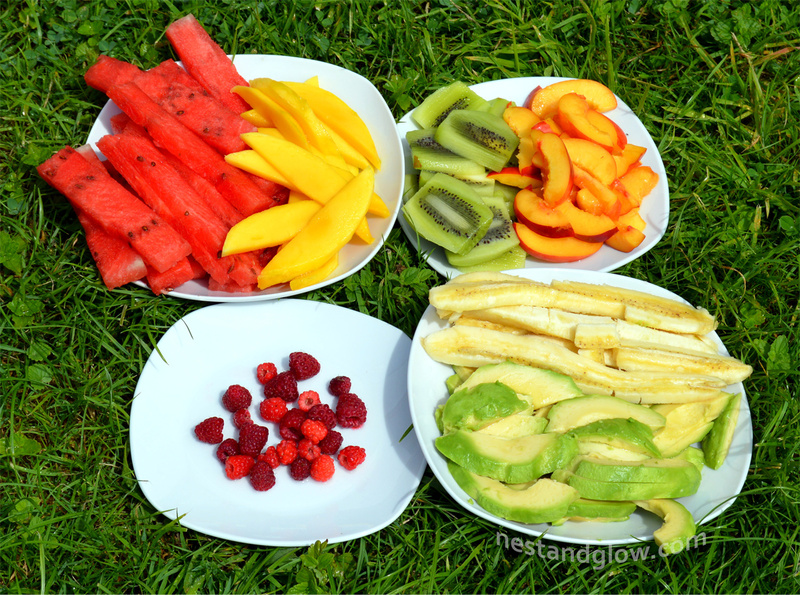 It’s best to add a rainbow of fruit (as its attractive and fruit of different colour usually has different vitamins) and fruit of different textures. Avocado is technically a fruit so belongs in these wraps and it is the one fruit that I recommend to always include. As there is no lettuce they are a bit more slippery than vegetable summer rolls to roll up. If you have any trouble wrapping them just add a piece of lettuce or rice between the fruit and paper. They are still much easier to roll up than sushi. 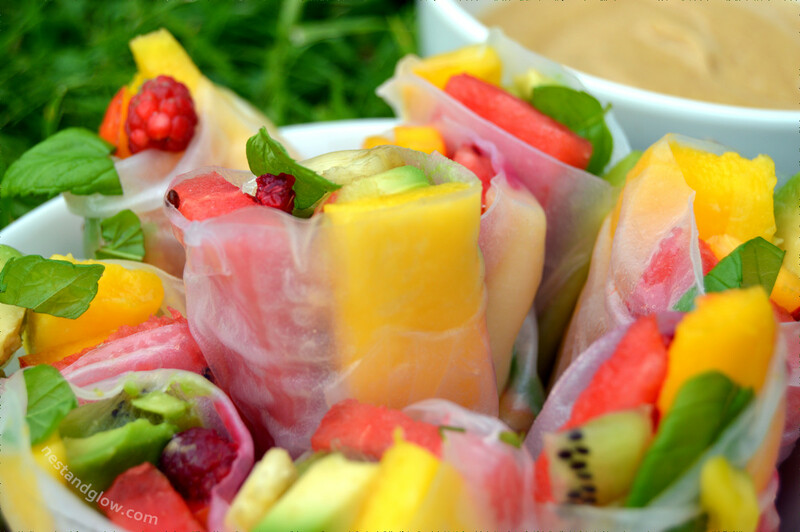 These fruity rolls are tasty enough on their own but the cashew salted caramel dip adds extra creaminess and sweetness. If you don’t like salted caramel or are avoiding nuts a strawberry chia jam also tastes great. Chop all fruit into thin strips, apart from small fruit like berries and the mint leaves. Submerge the rice paper in warm water for a few seconds, take out while it still has some shape as it will continue to soften once taken out of the water. Place rice paper flat on a flat surface and then add thin slices of fruit on 1/3 of the paper at an edge. Roll the rice paper up by folding over the filling, tucking in the sides then rolling to the edge. See the video for a demo. Add all of the salted caramel dip ingredients to a blender and add enough warm water to cover everything. Blend until smooth, you may need to add more water if the blender can’t break up everything / or if the dip is too stiff. Slice all of the rolls in the middle and enjoy by dipping in the sauce. They will last a few days in the fridge but are best eaten as soon as made.